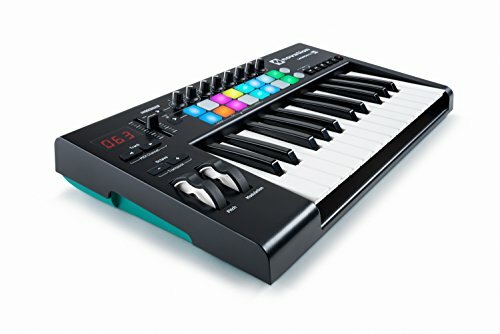 Though they are not designed to replace full size keyboards, 25-Key midi controllers offer convenience to a traveling musician. I like them because they only take up a limited amount of space on the studio table. Nowadays, these keys are designed with an awesome range of features, ensuring that you get the sounds you want. The best 25 key midi controller should meet your needs while offering you convenience. 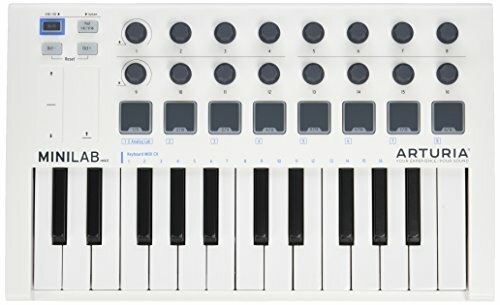 1 What Features Make The Best 25 Key Midi Controllers? 2.5 Do You Need Just 25 Keys? What Features Make The Best 25 Key Midi Controllers? 25 Key Midi Keyboards are offered with different features that draw recording artists to them. They allow you to get the specific effects and sounds you are looking for. Though they only have 25 keys, you can still access thousands of sounds when you attach these mini midi devices to your DAW, making them ideal for travel, live setups and small studio settings. The one feature that artists like is the compactness of these units, simply throw them in your backpack and groove on the move. Even better, the units are offered with a second recording option. There are effects, controls and modulations that help you craft a balance when you are recording. Different components and functions allow you to play different tracks from the keyboard and the control board. Better still, the MIDI interacts with other instruments in a studio. For instance, you can connect it to a keyboard for recording and additional effects. Lastly, the 25 Key Midi Controller easily integrates with different software, allowing you to spice up your recording. It accommodates Fruity Loops, Ableton and Logic Pro X among other software systems. In larger keyboards, drum pads are not as large. This makes these compact keyboards handy when you need to have control over drum mixes. These are knobs that you use to interlink your keyboard with software controls. This lets you add fades, sustain, reverb and other handy features to spice up your mixes. This is important when you want to shorten the process of clicking through the software.By interlinking these two, you will have diverse sounds. This is a simple feature that allows you to interface software with keyboard, making it easier for you to map out your next song and choose desired effects. Put simply, controller mapping on keyboards allow you to enjoy versatility and flexibility with the keyboard. While the above are common functions on the 25 Key Midi Controller, there are additions based on the make and model of your choice. This device is for those who are not interested with piano integrations, but are more concerned with having recording control. This is one of the most important equipment for an aspiring beatmakers. Again, if you are in a band and you want to add sounds and effects to your songs, this is also a suitable equipment.Plus, it is a good addition to a studio. The only problem, there are hundreds of makes and models to choose from. The rule of thumb is, let your needs guide you. Do You Need Just 25 Keys? 25 keys will suffice for electronic musicians and also hip hop beat makers. The keys allow you to play simple chord progressions and melodies. For those interested in real piano playing, these devices only span two octaves and, thereby, limiting. In fact, you may not need both your hands to play the keyboard. If you need more piano playing, you are better off considering a 49-key or a 61-key MID controller. 25 Key Midi Controllers are relatively the same size.You can place them on any desk and play even at the comfort of your laps. However, there are musicians that find the keys a little cramped for their taste. When choosing, consider the weight, for portability, and the overall dimensions of the keyboard for storage. If you are looking for an ultra portable midi controller, then check out the Best Mini Midi Controllers Review. When you press on keys, they should feel smooth. Keys can be semi-weighted or synth-action. Semi-weighted keys are relatively heavy and they bounce back when you release them. They have the feeling of a piano keyboard. Comparatively, synth-action keys, instead of weights, use springs to push the keyboard back to its original position. As a result, synth-action keys feel lighter and quicker. However, they might feel spongy and cheap when you play. Your preferences will determine the keyboard you choose; there is neither one that is better. How do you want your 25 Key Midi Controller to work? You can play melodies and chords without having to draw them in the piano roll. However, for those who are willing to pay a little extra money, you will find additional features that allow you to control DAW from your keyboard. This is a simple feature that saves you the time you go moving from keyboard to the mouse. Some also have transport controls that allow you to play, stop and record while others allow you advanced controls to tweak parameters and switch windows. While your needs will determine the device you choose, your choices might be limited by your budget. 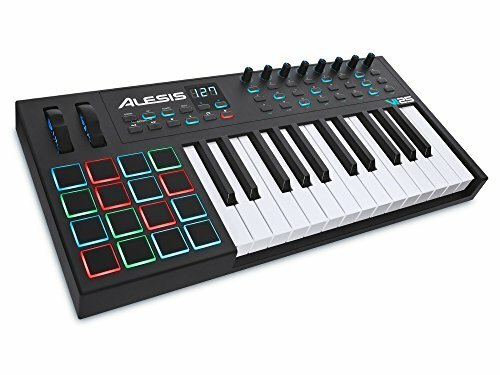 25 Key Midi Controllers are relatively cheap; even then, they are offered at different prices based on the brand and model you choose. Modern controllers are created for convenience with a lot of additional features. The more the features, the better the device. Novation created this keyboard controller exclusively for Ableton Live. It sports 16 velocity sensitive pads with different colors to give you all the control. It further features 8 knobs control buttons and dedicated navigation; all the features you will need to make music with ease. You can use the unit with Mac or PC. Its plug and play build makes it ready to use out-of-the-box. You will not need any drivers. It is a USB bus-powered keyboard controller that will not require any power cables to play. With the purchase of this unit, you are offered software to get you started including Ableton Live Lite, Novation Bass and V Station virtual instruments, XLN Audio Addictive Keys and about 4GB or Loopmasters samples. If you are looking for a unit that fits on your studio production perfectly, without taking up much space, I feel like this is your best bet. Even better, you can pack it in your backpack for on-the-road music making. The unit is only 12.4 inches long and weighs 1.6 pounds. 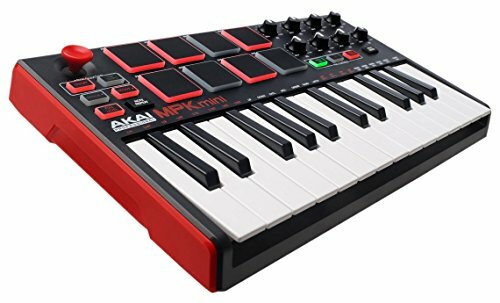 Like other units in its class, the Akai Mpk Mini Mk2 is USB powered. You do not need a power cable as long as you connect the unit to your computer. With the purchase, you are offered free virtual instruments packages you can download. The unit looks simple, but has been crammed with different features to ensure that you get the best when making music. It sports 25-synth action mini keys and 8 velocity sensitive pads, making it easy to use. It also features eight assignable knobs, giving you more control when you are making music. There are dedicated buttons for Note Repeat, Octave Up and Down and Full Level. If you are into composing digital music, this controller will fit you; it was made to allow you play virtual instruments as you make music. It sports 25 full sized and square-front semi weighted keys that feel heavy and sturdy when you play. The keys are highly responsive, making them feel easy. There are 16 multicolored RGB pads. The pads are pressure and velocity sensitive. For control, you are offered 8 knobs and 24 assignable buttons. This gives you hands-on control of the plug-ins, instruments and digital audio workstation. This unit is powered by USB connection and you, therefore, do not need a power adapter. However, you will be offered an optional power adapter for setups that are complex. With the purchase of this unit, you are offered Ableton Live Lite and AIR Xpand! 2 virtual instruments for free. You can download these software immediately you receive your unit. Midi controllers are portable, but this unit has taken that a notch higher; you can easily place it on a small space in your studio and easily pack it for on-the-road music production. It is more popular for its key responsiveness. This comes handy when you are mixing and matching sound effects. Out of the box, you get 500 of V-collection presets, 17 Keyboard instruments and synthesizers and a Midi controller that is ready to use. The controller is offered with 16 assignable encoders, letting you control your DAW from its interface. Even better, it ingrates seamlessly with different DAWs, letting you make music the easy way. If you are looking for expressive performance, I feel that this unit will serve you best. It is offered with sequencers and digital audio workstations to allow you to create music with much ease. 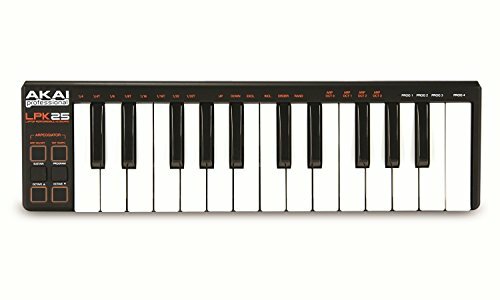 This unit features 25 velocity and pressure sensitive mini keyboard keys, which are highly portable. You can use this unit for writing sessions, compiling ideas and composing sounds. It features nearly every feature you need for music production.The Akai Lpk 25 comes with a built-in arpeggiator. This is a feature that guides you through modern music making.The unit features a plug and play design and is USB powered. You can use it with either PC or Mac with no drivers required. I like the fact that this unit integrates with multiple DAWs including Ableton, Digital Performer, Studio One, Cubase, Logic, Reaper and Pro Tools among others. For hands-on control, you are offered sustain button, tap tempo and octave up and down. With this purchase, you are offered editing software for PC and Mac. The Novation Launchkey 25 is the winner of this roundup. It is offered with great controls, integrates seamlessly with Ableton Live and is offered at a great price. You will love how light the unit is and how intuitive its interface gets. For control, the controller has knobs, wheels, and sliders, letting you use the device with ease. Even better, it is offered with bundled software to get you started.It is ideal for all starting and professional musicians. There are many makes and models of Midi controllers.Choose based on what you will be playing. The 25 key controllers are ideal for any musician or beat maker and especially those always on-the-go.